Our Cork Gun Shooting Range is ideal for your wild west party or event and can be hired alongside the Rodeo Bull or on its own. The Shooting Range features a range of targets for participants to try and shoot down including cans, bottles that split in half when hit, traditional knockdown targets, ducks, and swinging targets. Participants can use either the Co2 powered guns that have been converted to fire corks or a bow and rubber tipped arrows. The Cork Gun Shooting Range is supplied with one of our professional operators who will ensure the safe use of the game, reset the targets as needed and re-gas the rifles when required. The Cork Gun Shooting Range can be used both indoors and outdoors - it requires a space of 18x16x9ft high - and is suitable for participants age 6 to adult. Our Shooting Range can be hired either on its own or alongside the Rodeo Bull or any of the other Wild West Games we have for hire. 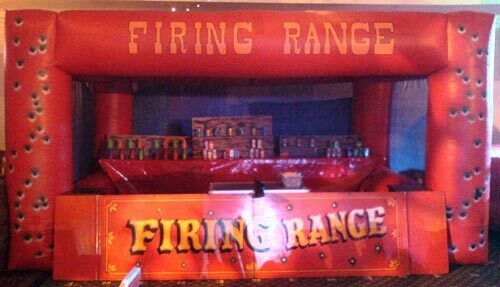 To obtain a competitive quote for the hire of the Cork Gun Shooting Range and the other Wild West theme games, or if you have any queries concerning hire, then please don't hesitate to call or contact us and we will be pleased to assist you.